ISLAMABAD, Dec 16 (APP): Special Assistant to the Prime Minister on Foreign Affairs (SAPM), Tariq Fatemi has said that Pakistan was aiming at building a comprehensive, sustained and forward looking relationship with the United States. Fatemi expressed these views during a media briefing on his current visit to the United States at the Pakistan Embassy in Washington. He informed Pakistani media persons that the primary purpose of his current official visit to the US was twofold i.e. to touch base with the outgoing US administration by reviewing progress in the current bilateral relations (over three and a half years) and forge links with the new US administration that would assume office in January 2017. 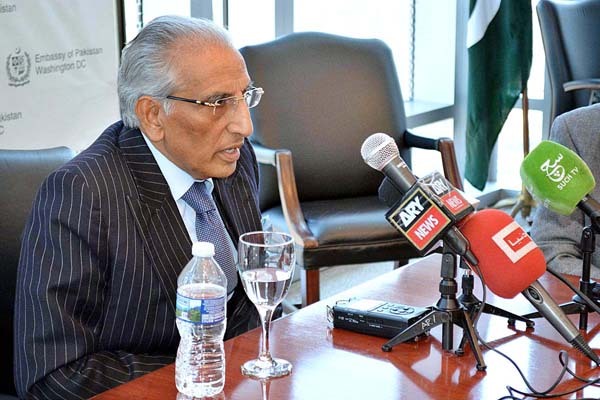 Tariq Fatemi, during his official and private engagements in the USA, briefed the the US think tanks, policy-makers and influentials on the positive developments in Pakistan over the last three years. government to build a stable and secure Pakistan. Fatemi highlighted the tremendous sacrifices rendered by the people and security forces of Pakistan in the campaign against terrorism during his contacts in Washington. He emphasized that Pakistan had paid a very heavy price and was firmly committed to eliminating terrorism in all its forms and manifestations. He, however, added that Pakistan, being a sovereign state, would decide the scale, pace and reach of its counter terrorism efforts in line with its economic and operational limitations as well as other capacity constraints. Fatemi underscored that his current official visit to the US afforded an excellent opportunity to explain Pakistan’s perspective to his the US counterparts regarding key issues such as governance, economy, counter-terrorism efforts etc. He had a productive round of meetings with Deputy Secretary of State Antony Blinken and incumbent National Security Advisor Susan Rice. During his stay in Washington DC, he also met Chairman of the Senate Foreign Relations Committee Senator Bob Corker and Senator John McCain. Fatemi remarked that though Trump Administration was not yet in place, Pakistan looked forward to working closely with the new president-elect and his team with particular focus on economic linkages and trade that formed a common denominator in the agenda of Prime Minister Nawaz Sharif and president-elect Trump. Fatemi concluded the briefing by indicating that his current visit to the US would be followed by other high level visits.